Darkness is setting upon the world; the workweek is coming to a close. A week of activity, a week of growth, a tiring week. But as the sun goes down, a new day is being ushered in: the day for which we toiled the entire week, a day of rest and tranquility, the holy Shabbat. 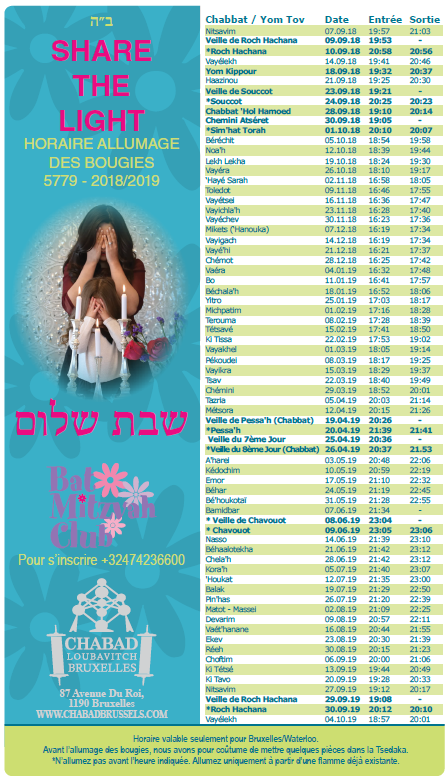 Greeting the Shabbat (and also Jewish holidays) are girls and women across the globe. Shortly before sunset they light candles, which usher in peace and blessing to their homes and to the world. Origin and Reasons The first woman to light Shabbat candles was our Matriarch Sarah. According to Jewish tradition, Sarah would light the Shabbat candles on the eve of the Shabbat, in the famous tent she shared with Abraham, and the candles would miraculously burn from one Friday to the next. Thus the pleasant sight of Sarah's candles greeted the many guests that visited Abraham and Sarah's tent throughout the week. When Sarah passed away, the flames on her Shabbat candles were extinguished. A few years later, when Isaac saw that the Shabbat candles of his prospective wife, Rebecca, had the same miraculous ability to continue burning throughout the week, he understood that she was Sarah's righteous successor, and he wed her happily. Peace in the Home: Shabbat and holidays are intended to be peaceful oases in our chaotic lives. We illuminate our home so that we should not stumble in the darkness, something which would have a decidedly un-peaceful effect. Honoring the Day: We add light in the home to honor the Shabbat Queen. Pleasure: To fully enjoy the Shabbat delicacies, one must be able to see the food—which requires a well-lit room. The mystics explain that Shabbat is the day that brings illumination to our world, which so often seems to be dark and negative. Furthermore, candles are a metaphor for Torah and for the human soul. The candles represent the light we introduce into the world through studying Torah and observing its precepts. And they also represent the "additional soul" which, our Sages explain, we are endowed with on Shabbat. The Basics Prepare the candles (or oil and wicks) and matches, and a fire-proof surface upon which to place the match after lighting the candles, such as a metal or ceramic plate.1 The candles should be set in close proximity to where you will eat the Shabbat meal. The candles should be sufficiently large (or the oil bountiful enough) so that the flame will burn for the duration of the meal. Many have the custom, when applicable, that the man of the household sets up and prepares the candles for lighting. Until marriage, women and girls light one candle. Post-marriage, women light (at least) two candles. Some add an additional candle for each child; e.g., a woman with three children lights five candles. If no woman (over the age of bat mitzvah) is present in the home, a man should light the candles. While dressed in your Shabbat or holiday finery, place several coins in a charity box. Many have the custom to dedicate this charity to the poor in Israel. Light the candles. Place the lit match on the designated surface. Extend your hands over the candles, draw them inwards three times in a circular motion, and then cover your eyes. Transliteration: Baruch a-ta A-do-nay Elo-hei-nu me-lech ha-o-lam a-sher ki-dee-sha-nu bi-mitz-vo-tav vi-tzi-va-noo li-had-leek ner shel Sha-bbat ko-desh. Translation: Blessed are you, Lord our G‑d, King of the universe, who has sanctified us with His commandments, and commanded us to kindle the light of the Holy Shabbat. Now, while your eyes are still covered, is an auspicious time to pray for your heart's desires. The custom is to pray for children who will be upright and G‑d fearing, and for the coming of Moshiach. Take the time also to pray for others who need blessings and good health. Uncover your eyes, gaze at the candles, and then greet everyone with blessings of a good Shabbat or holiday. With the lighting of the candles, a woman ushers in the holy Shabbat. No "weekday" activities are to be done from that point on, as she has now entered a world of tranquility.